The major players participating in “UFC 154: St-Pierre vs. Condit” will be hitting the podium today at the Montreal Science Center in Canada. Stream Thursday’s pre-fight press conference live right here on 5thRound.com starting at Noon ET/9AM PT. 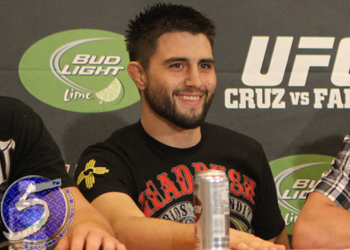 In addition to UFC director of Canadian operations Tom Wright, reigning welterweight king Georges St-Pierre and interim champ Carlos Condit (Pictured) will be in attendance. UFC 154 takes place November 17th inside Montreal’s Bell Centre. Tickets for the show went on sale this morning.